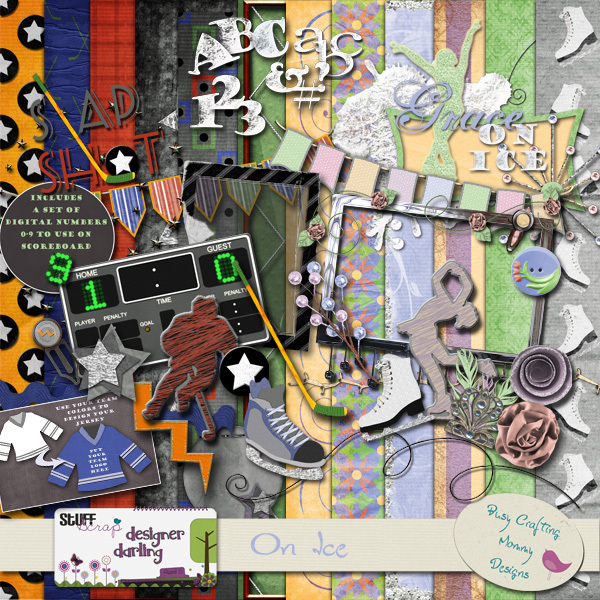 Voting has begun for the final round of the designer competition at Stuff to Scrap. If you like my kit On Ice I would love it so much if you could find the time to vote at Stuff to Scrap HERE. Also as a big thank you to everyone who has voted for me, left me a comment, or just liked my kits well enough to allow them to take up valuable space on their hard drive 🙂 I have an add on you can download here today and another that will be posted tomorrow. Today’s add on features the hockey portion of the kit and tomorrow’s will feature the figure skating portion. If you haven’t already, you can also pick up a Facebook Fan exclusive at my fan page of a set of cardstocks to match the kit. Well, this is the final round of the designer competition at Stuff to Scrap. It’s been a ton of work, but I’ll be a little sad to see it end. It’s been lots of fun and I’ve learned so much from the judges. I want to thank everyone for their nice comments and any votes that were sent my way. And I want to especially thank my and incredibly patient surprisingly sportive husband who let me show him every little change I made and listened to me jabber non-stop about this competition and was ok-ish with letting me spend pretty much every second of my free time messing around with Photoshop. Hey Babe, it’s all over, you can have me back now! For this final round we were able to choose any theme and any set of colors. We had to make a full sized kit with 10-12 papers and 25-35 elements as well as a full alphabet. I’ve had some great photos of Fiona on the Jumbotron at a hockey game from a couple years ago that I have been wanting to scrap forever. I decided that I would make a kit to use for these photos. But I decided that I wanted to show different kinds of skating, for this kit I chose hockey and figure skating. I chose colors that I felt would work well in bright bold colors for hockey and in soft pastel colors for figure skating. I had so much fun putting this kit together and using it. I hope you enjoy it too. Also don’t forget to vote for me at STS beginning on Wednesday if you liked this kit. The competition has been super tight as all the designers are really amazing and the kits have all been so well put together. All I can say is that I’m really glad I’m not a judge for this competition! I don’t know how they will make their final decisions! And here is a preview of the alpha included in the kit. It comes with upper and lowercase letters, numbers 0-9, and a fun assortment of symbols. I had a great time playing with the texture on these elements to make them look all icy. Also if you stop by my Facebook fan page-click on the imageto go there- and like me you will find this matching set of cardstocks in the Exclusive tab on the left. I also have two add-on kits to coordinate with the big kit the first will be available here on my blog beginning on Tuesday night with the second on Wednesday night. So remember to stop back by for the add ons and to vote!!! Here are a couple layouts I made using my kit On Ice, both were made using the kit, cardstocks, and two add ons.